What was once referred to as "the grossest wall in the city," will soon become one of the District's sleekest. WASHINGTON — What was once referred to as “the grossest wall in the city” will soon become one of the District’s sleekest. The Atlantic Plumbing project will soon bring apartments, condos, restaurants, artists and green space to three formerly dilapidated lots located in one of the most vibrant and fast-growing neighborhoods in the city: 8th and V Streets NW. “A lot of people have moved to the East from 14th Street because there are slightly more affordable options in this area. 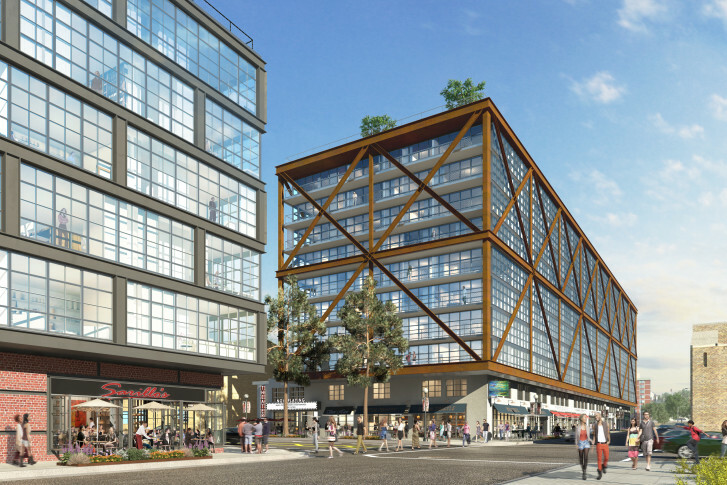 … This neighborhood has a little bit more of a bohemian kind of grit to it,” says Matt Blocher, senior vice president of JBG, the development company that acquired the project in 2009. Atlantic Plumbing A, a 310-unit, 10-story apartment building with 19,100 square feet of ground-floor retail and studio space for artists; Atlantic Plumbing B, a 62-unit condo building; and Atlantic Plumbing C, a condo and boutique hotel building, will soon replace empty spaces next to D.C.’s legendary 9:30 Club. A Landmark Theatre will also be on site. “The typical sort of residential building that was pretty much expected is being challenged. … It’s a very modern, glassy, airy, light-filled condo and apartment building, but with an industrial edge to it,” Adjmi says. The building’s space along 8th Street will feature roll-up garage doors for artist studios, as well as space for retail and restaurants. And the Washington Project for the Arts will move into 1,500 square feet on the first lot of the project. Adjmi is hiring a Swedish graffiti artist to paint the inside elevator shaft of the building, which will be visible from the outside, and bricks saved from the former Atlantic Plumbing building will be used in the completed building’s lobby. The bricks aren’t the only nod to the lot’s former life. The roof decks of the buildings will include overgrown vegetation — a common characteristic on the former site. “I like the idea of having the industrial character being maintained … but then overlaying this green landscaping on top of it,” Adjmi says. The rooftop on both the condo building and the apartment building will offer panoramic, uninterrupted views of the city, thanks to height restrictions south of the project. The apartment building will also feature a resort-style pool, a fitness center, an indoor/outdoor bar and a common lounge area. Both Atlantic Plumbing A and B are expected to be finished next year; Adjmi predicts the third lot will be complete a year and a half from now.